Other scientists and scholars' introductions, in full length, as published in Ove von Spaeth's "The Suppressed Record", VOLUME 1 of his book-series "Assassinating Moses". - In addition, the table of Contents of Vol. 1. Where did the Bible's renowned Moses character originally come from? Who was he? When did he live? Did he exist at all? With dauntless open-mindedness and an implicit faith in the historical substance of ancient tradition worthy of the name of Schliemann, Danish author and researcher Ove von Spaeth takes the reader on an impressive Odyssey round the source material of antiquity in order to answer these highly interesting questions. It might as well be said at once: This work probably renders the most original, and in various ways most well-documented presentation of an answer to the (Moses) question within modern research. Firstly Ove von Spaeth has dug up countless, and to most people obviously unknown amounts of information about Moses from Egyptian, Jewish, Greek, Latin, Arabic, and Indian sources, only to collate, with special focus on ancient Egyptian conditions, everything in a grand synthesis. This has never been done before! Secondly he has involved archaeological research, carried out astronomic dating and geographical historical reconstruction, as well as subjected the character of Moses to wide-ranging linguistic, cultural historical and religious phenomenological analysis. Nor has a similar overall account of the matter ever been given before. His background being an ideal interdisciplinary access and an almost encyclopaedic knowledge of the subject, Ove von Spaeth is able to adopt new exciting approaches to research regarding the character of Moses. He succeeds with cogent strength in rendering probable the origin of Moses, where he came from, who he actually was, when he lived, and, indeed also that he has in fact existed. Here it should be emphasized that this account of Moses does not represent a starry-eyed pop-scientific attempt to prove that "the Bible was right after all". On the contrary, the author's perspicacious point shows that regarding Moses it is probably not 'right' at least in its present form. The author makes comparisons with other ancient sources presenting, over a wide front, quite a different (though not unambiguous) picture. Nevertheless, the material presented in the book necessarily implies a clash with certain aspects of modern theological research which categorically reject the factual historical existence of Moses. As shown by the author this rejection is based either on deliberate discarding of "problematic" non-biblical sources and circumstances or on regrettable ignorance. Quite remarkable as the Bible is probably the most thoroughly studied book in world literature. In the light of this it is to be hoped that Ove von Spaeth's book may contribute to marshal new inter-disciplinary standards for future Bible research in general, and for Moses research in particular - nationally as well as internationally. The author's fluently rapid style should be emphasized, too. He has a rare aptitude for passing on an extremely complex and sometimes not very accessible subject matter in a vivid yet logically structured and easily understood manner. Forming a sharp contrast to the short-sighted academics of modernity, finding in ancient literature merely words, Ove von Spaeth finds its imposing spirit, too. In other words one feels enriched as a human being, not just intellectually enlightened, when he with unusual insight and understanding explains the religious rationale behind innumerable phenomena of history as well as of the present time. Having read this work nobody will doubt the obvious relevance to modern people of studying antiquity. Already the overall picture in this book - of the detection of some radical circumstances behind Moses' role in the history of Egypt and the Hebrew people - is extremely exciting in itself. Rightly, Ove von Spaeth has chosen a vivid style in order to reach a wider circle of readers than mere specialists. Furthermore, this work is inter-disciplinary to an exceptional degree based on extensive and thorough studies within history, theology, archaeology, and the history of religion as well as the history of astronomy. With zeal and flair Ove von Spaeth has collected evidence from widely different sources to support his main thesis regarding Moses and his status and place in history; and from the astronomical-historical point of view I find the basic assumption of a certain planetary constellation in 1537 BC worth testing in relation to biblical research, Egyptology, archaeology, as well as general history. The actual occurrence of the above-mentioned planetary constellation and other astronomical circumstances may be objectively verified by computation based on modern astronomical theory. And the author argues that the Moses tradition in source material from Egyptology, the Bible, the Rabbinical Texts, and from a number of historians of antiquity reflects these astronomical phenomena. He is also of the opinion that this starting point throws new light on the coherence of the remaining source material. The author's dating of Moses at 1500-1400 BC, about 200 years earlier than the most frequently accepted dating in 11th century BC, has previously been suggested by researchers of various backgrounds and nationalities: Egyptologists, historians of religion, and archaeologists throughout the last one hundred years (e.g. G. Lefébure, V.H. Juvelius, J. Garstang, and lately, J.J. Bimson and S. Ratié, among others). Thus Ove von Spaeth's assertion is not unprecedented and in the present work the hypothesis has been confronted with a much wider spectrum of source material than in the works of the researchers mentioned. An extensive bibliography reveals extraordinarily thorough background studies. The entire account and its results deserve to be known also outside Scandinavia. Contents - of Vol. 1: "The Suppressed Record"
The invisible alteration of the text. - Could Pharaoh's Daughter speak Hebrew? Were Aaron and Miriam not Moses' siblings? - Did Moses speak poor Hebrew? PREFACE BY AUTHOR: This re-evaluation of the time and status of the historical Moses and the special inspirations behind his work - is based on interdisciplinary scientific- and cultural historical research, connecting archaeological findings, textual research, and astronomical dating - all being evaluated in relation to the Bible, the Rabbinical Writings, and various important authors of Antiquity. Many handed-down sources and findings have, for the first time, been put into a greater context all of which should be judged in its entirety. The book is not based on single sources or solitary decisions - rather,the focus is on the presentation of a long string of clues and indications; these may be considered a "special offer" to further research. The book can be read without previous scientific qualifications. It is not an attempt to present Moses' "curriculum vitae", nor is it "documentary fiction", or a historical account distributed in trendy reading form. Annotations at the bottom of pages or at special places have been left out in favour of coherence and legibility. Instead, annotations have been continuously included in the reading-matter. References of sources are given directly on the spot and may, as you like, be passed over or used in further documentation just like summaries and appendices. The intentional lack of other current annotation is compensated for by a comprehensive bibliography with further substantiation of the information given in the book. The bibliography has been divided into various fields of subject matter in order to facilitate verification. The British Egyptologist Alan H. Gardiner's transcription of Egyptian names has been preferred. Supplementary astronomical data are presented at the end of the book. A number of researchers and experts have from their separate fields of science most kindly contributed with guidance, criticism, argumentation, and encouragement. Naturally, these experts are not responsible for the way in which their information has been used. Historical Astronomy: Kristian Peder Moesgaard, D.Sc. Professor, History of Science Department, Aarhus University - Director of the Steno Museum, The Danish National Museum for the History of Science, Aarhus University. Egyptology: Erik Iversen, Ph.D.,h.c., Assistant Professor, formerly Department of Egyptology, University of Copenhagen; - Eva Richter Aeroe, M.A., Assistant Professor, Carsten Niebuhr Institute, University of Copenhagen; - Geoffrey T. Martin, Prof.D., Department of Egyptology, London University, England. Hebrew Philology/Bible- and Talmud Texts: Egon K. Keck, M.A. in Semitic Languages, Subject Adviser, Dep. of Judaism, The Royal National Library of Denmark, Copenhagen; - S. Heimann, Rabbi, formerly Dep. of Judaism, The Royal National Library of Denmark, Copenhagen; - Jens-André P. Herbener, M.A. in Semitic Philology and Comparative Religion, and Project leader, at The Royal National Library of Denmark, of the new scholarly translation into Danish of the Hebrew Bible (Old Testament). Biblical Research: Bent Melchior, former Chief Rabbi of Denmark; - Jakob H. Groenbaek, B.D., Subject Adviser, The Royal National Library of Denmark, Copenhagen; - Eduard Nielsen, B.D., Professor, Dep. of Biblical Exegesis, University of Copenhagen; - Niels Peter Lemche, B.D., Professor, Dep. of Biblical Exegesis, University of Copenhagen. Josephus Research: Per Bilde, D.D., Study of Religion, Professor, Aarhus University. Greek Philology and Mythology: Leo Hjortsoe, Assistant Professor, Department of Greek and Latin, University of Copenhagen. Arabian Philology and History: Ellen Wulff, M.A., Carsten Niebuhr Institute, Professor, University of Copenhagen; - Philippe Provencal, M.A., Semitic Philology, Aarhus University. History: Jens Jörgensen, MA in History, former Headmaster, officiately app. examiner in history at the Universities of Copenhagen, Aarhus and Odense. Principles of the Jewish/Mosaic Calendar: Bent Lexner, Chief Rabbi of Denmark, Copenhagen. Astronomical Calculation: Leif Kahl Kristensen, Ph.D., Assistant Professor, Department of History of Science, Aarhus University; - K.A. Ternoe, M.A., formerly Department of Physics, Danish Post-Graduate Training College for Teachers, Copenhagen; - Kyril Fabrin, Assist. Professor, Mathematics & Astronomy, formerly Aalborg University; - H. Quade Rasmusen, Astronomer, Kalundborg, DK; - F.R. Stephenson, D.C., Astronomer, University of Durham, England; - David Dunham, DC, Astronomer, US Naval Observatory, Washington DC, USA. Further thanks to: Erik Dal, Ph.D., Chief librarian, The Royal National Library of Denmark, Copenhagen; - Eva Björnböl, Research-librarian, Cairo; - Jannie Fursund, LLD, Assistant Professor; - Jeppe Berg Sandvej, Ph.D., in Theology and History of Ideas; - Asmus Koefoed, Bach.Phys. ; - Karine Smidth, Journalist; - Sidney Maage, Principal, Ministry of Defence; - Raymond Bildstedfelt, Inf.Director, DI; - Henry Lincoln, Writer, Researcher; - Sven Tito Achen, Symbology Historian, and Council Secretary, formerly The Danish Research Council for the Humanities; - Guni Martin, Instructor, Writer, Publisher; - Marianne Illum, proofreader; - Evan Bogan, Publ. Director; - The Staff of The Royal National Library of Denmark, and of Dep. II of the Copenhagen University Library; - Construction of Computer Programs: Laurids Pedersen, Nysted, DK; - Cynthia Gyldenholm, Translator; - Ulla Hoff, H.D., English language, Translator; - Astronomical Computer Calculations: Jarl Hansen, Macro Systems Internet, Coín, Spain. Critical material from an array of ancient and modern sources regarding the historical Moses is gathered and presented here in completeness for the first time. The data reveals surprising facts including a royal plot and attack on Moses in Egypt. His life and position appear to be quite different from prevailing perspectives. The numerous findings confirm the Egyptian base of this unique biblical leader. Everyone knows about the story of Moses found by Pharaoh's daughter in the reeds by the Nile’s riverside - but was he just a myth? Or did parts of modern biblical research commit "murder on history"? But the episode with a baby in a reed basket boat appears everywhere in Antiquity as a well-defined ritual practiced for royal heirs. Via astronomical dating which can be verified objectively on the basis of modern scientific astronomy, knowledge of Moses' era and true status is restored; the book's thorough documentation makes possible the solving of many biblical enigmas. Key Phrases : historical Moses, ancient Egypt, archaeology, ancient astronomy, anthropology, historians of antiquity, Bible, chronology, cultural history, mystery cults, mystery play, star cult, Rabbinical Writings, oracles, religious history, theology, Old Testament, Torah, Pentateuch, Exodus, Talmud, Egyptology, Ove von Spaeth, Philo, Josephus, Jethro, Isis, royal infant ritual, Queen Hatshepsut, Pharaoh's Daughter, Thebes, Pharaoh Tuthmosis III, Sinai, Sirius, the World-axis, mythology research. In the Volume 1 of the series on the historical Moses, the readers are from the outset given surprising but well-documented facts about the events which in the Bible are referred to only through fragments. But now we can follow this influential and versatile personality, Moses, his track of events from birth through adolescence at Pharaoh's court, - during the first 40 years of his life - where "... Moses was learned in all the wisdom of the Egyptians ..." (Acts 7:22) and he have had experiences with greatness and fall; - a course which revealed an amazingly otherwise background than previously thought regarding his mission both as a religion-founder and a leader of a huge group of fleeing people. Following new and even untraditional paths the book reveals a surprisingly rich stored up treasure of numerous interesting, handed down information from Antiquity about Moses and his life in Egypt. In a most probable way the material is able to demonstrate relevant details about Moses in connection with the pharaonic court in the 18th dynasty in 1500-1400 BC. Also it indicates that Moses in the Egyptian scenario had been introduced early to a different fate in prospect than the one which became our view known from the Bible. With one surprise after another, most of the book deals with - and presents - a veritable wealth of new information about Moses' first part of the life and drama during the reigns of different pharaohs of ancient Egypt and its impressive civilization. - What lay behind the mysterious account of Moses' birth? - Do the earliest texts of the Bible contain revisions and ‘editing’ of accounts? - Was Moses borne by Pharaoh's Daughter and what could that mean? - What is the implication of Moses' name being Egyptian? - Why are the first many years of Moses' life not spoken of? A fascinating and untraditional material is here for the first time collected as a whole: "The Suppressed Record" reveals details of a hidden but full-scale attack on Moses' identity as a person as well as a historical character; and reveals his life and position as being surprisingly different from what has hitherto been assumed. The episode of "the infant sailing on the river" was a widespread and well-known ceremonial for royal children; but was biblical episode on the Egyptians' drowning of other children a sacrificial act connected with the ancient cultic rituals? New historical knowledge and many rare sources about Moses handed down through the ages prove their connection with Egyptian tradition and archaeological findings showing them to be mutually related to the Bible, the 'Rabbinical Writings' as well as the authors of Antiquity. The dating is based on numerous sources, not least the recovered ancient astronomical data, all possible to verify scientifically. Historical and biblical knowledge regarding the time and status of Moses - about which the lack of sufficient facts has hitherto created confusion - can now be re-established. It will contribute to the solution of several puzzling biblical matters. Living history, comfortably providing the reader with comfortable access to the exceptional sources. At some time someone had to break through conventional views and, instead, present the story of Moses in a logical coherence based on the large, often very detailed information about him which has still been preserved. Eventually, this has happened - and in a refreshingly different form. - This book is based on solid documentary material from a notably large spectrum also of rare sources (in addition to the Talmud, for instance) - seen for the first time as a collected whole! The present re-evaluation of Moses' status and era is to the most impressive extent based in inter-disciplinary research of the history of ancient cultures. The rare text material itself is elementarily exciting - and is now made accessible to readers without a formal scientific education or scholarly qualifications. Moses has been the inspiration for novels and films - but the data of the sources combined with archaeological facts reveal that his real life-story is the most exciting of all. The status and era of Moses being re-evaluated in this book are based on inter-disciplinary historical research. By means of such complementary evidence, light is cast upon here on some hitherto hidden chapters of our common cultural prehistory: Out of the well-known biblical story an untraditional and stronger Egyptian background is brought to light. Two important keys are astronomical dating, moving Moses from myth to history, and the ancient magical rites and mystery plays, whose acting language was lost to readers in later times. Among the first decisive results appearing by this special historical background is the fact that the Pharaoh's daughter, who found him near the Nile bank and took care of him and brought him up, must have been none other than the famous Queen Hatshepsut. "Pharaoh's Daughter" was a title not given to any other daughter of Pharaoh but only to the crown princesses. Hatshepsut was exactly this kind of high ranking princess because of her full royal descent when both of her parents were of the royal family and cultic initiated. Even while her father was alive, but her two brothers had died young, she was ceremonially raised to be his co-regent, and in her later years she herself was regularly crowned as female pharaoh. Even, according to the solid indications in Ove von Spaeth's extensive source material of Antiquity, Hatshepsut was not only the Pharaoh's daughter, who found Moses and brought him up as her son - much evidence material suggests that she was his real mother. All indications pointing to that Moses was brought up to be a pharaoh. Such was conditioned on having a highranking Egyptian family background and, in fact, also his name Moses is a genuine Egyptian name. The book argues and demonstrates how it would be quite unlikely that a child, a foundling, from another cultural context - for instance, of Hebrew origin - could have received a thoroughly royal Egyptian upbringing and initiated into Egyptian cultic mysteries. The book further explores the ancient source material concerning the biblical figure of Jethro at Sinai as an Egyptian of royal blood and advisor to the Pharaoh and argues the ways in which he may have been the biological father of Moses. Hatshepsut's royal mother, Ahmose, had in her time as queen arranged that her daughter (Hatshepsut) could be born as a "full-blood" royal family member. Therefore, Queen Ahmose had united with the superior god at a specific time when some specific celestial constellations conjoined in the sky. These were circumstances considered favourable to union leading to divine manifestation within the couple. In her own time, Hatshepsut could only unite with a royal relative and, at that time, not her younger half-brother, the future Tuthmosis III, on account of his extreme youth. In this situation, the divine immanence in her partner was represented by another high ranking member of her family of royal blood, Jehtro. "Hieros gamos" (the sacred wedding) was thus the cultic act where the god begat earthly children assigned for special purposes. Many who study Antiquity meet a humoristic view on all the god-children Zeus produced. However, this was a mythology world being re-played and performed through a religious royal cultic set-up. This rite was common across the ancient world, including ancient Greece and Rome. For example, many Roman emperors, until Constantine the Great, were perceived as divine in origin - "Sol Invictus". The interaction between a ruler and the gods was vital to validation of governmental power and authority. A detailed description is being presented by Ove von Spaeth regarding how such rites of "hieros gamos" were arranged in ancient Egypt. In the temple of a superior god there was a special, royal chamber where this action could take place, actually or symbolically. The king was cast in the role of the god with full regalia. The rite was performed as a special, cultic drama by means of which the queen came to conceive. In accordance with such rites, after the royal son was born, it took three months before the new royal mother again appeared in public and this occurred in the form of a cleansing bath in the Nile. The traditional biblical description of the Pharaoh's Daughter bathing at the Nile bank may be viewed in the light of such a ritual ceremony that led to her reception of a divine child - Moses - floating in a boat, "a small ark" according to the biblical texts and writings. Not only in the Egyptian culture but also in other parts of the world the future kings in their three-month age were through the gods presented most often from a river or the sea, all in the context of a religious mystery play. The queen or princess giving birth had in the time before and after birth remained at an isolated place and first became officially the mother of the child after the ceremony by the water. However, many parallels to this phenomenon exist in religious history, concerning a king at an early stage when being a baby came floating to the country to which he was going to be a king. Where he arrives from was not always told. In this way it took place, for example, in the Danish legend about King Skjold (King Shief). The traditional founder of the Athens, King Kekrops, migrated from Egypt in the time of Moses - according to ancient Church history writer Eusebius - and had, at the new place, performed this royal cultic ritual in the same way. The ancient, handed down knowledge of Moses is sustained by our time's increased information about the old Egyptian royal family. The family relations had decisive importance to the changed life of Moses in Egypt. In connection with the exact information of the 'Rabbinical Writings' it is now possible to ascertain that in 1534 BC (in February) the Daughter of Pharaoh gave birth to Moses. The time in question is consistent with the coronation of Hatshepsut the year before, when this young daughter of Pharaoh Tuthmosis I became crowned by a ceremony to be her father's co-regent with an official title as: Pharaoh's Daughter! The problem of the scholars' researching hitherto concerning the century in which Moses lived, can apparently be solved based on the verifying of surviving 'Rabbinical Writings' astronomical dating and calendar information in relation to Egyptology and archaeological research. Hatshepsut became a queen (1522 BC) and - very unusual - was later crowned as Pharaoh (1509 BC); to certain degrees this protected her son - Moses - as heir to the throne. When Moses was around 40 years, Jethro first - and later Moses himself - were pulled out of Egypt by plots carried out by Moses' half-brother, the later Tuthmosis III in collusion with many of the priests. So, it happened that Moses instead of being the ruler of Egypt, became the founder of the monotheistic religion(s) - still existing in our present day. An overview: The book presents a special material, based on Ove von Spaeth's extensive investigations, crucial to the understanding that: - 1) Moses was an Egyptian and not a Hebrew as assumed for a long time - a condition confirmed as based on the ancient texts and also on the then widely used royal infant ritual (the reception at the river) which he had to perform. And - 2) that Moses actually was the Son of "Pharaoh's Daughter" and was the candidate to the Egyptian throne. Finally, it is demonstrated on the basis of the intriguing source material that - 3) the pharaonic daughter in question is convincingly indicated as being the historic, central person, who later became known as Queen Hatshepsut. A high-ranking member of the royal family, wearing the title/name of the river god, Iteru, was Jethro(!) who may have been the biological father of Moses. Later he had to leave Egypt and live in exile at Sinai. 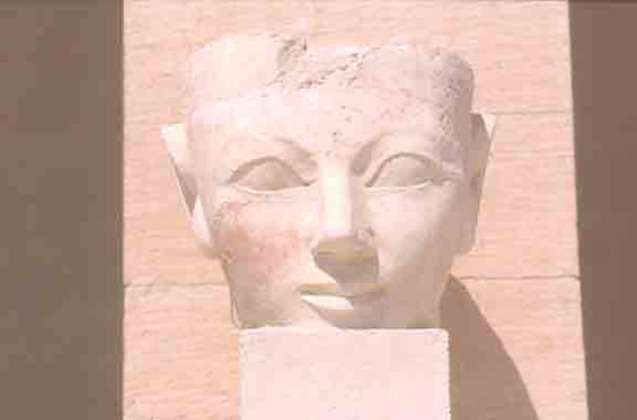 Moses' probable mother, Hatshepsut, was then married to her younger half-brother, the later Tuthmosis II, who ruled ca. 1522-1509 BC. He was the son of Tuthmosis I and Mutnofret, a Lady-in-Waiting, who was not of royal blood. The ancient Church historian, Eusebius of Caesarea, refers the handed down knowledge about Moses living at the pharaonic court, and about the husband (Tuthmosis II) of Pharaoh's Daughter as being the oldest known case of suffering from elephantiasis. The 3,500 year old mummy of Tuthmosis II - not found until modern age, in 1881, - in fact reveals such an ailment - the worst seen on any royal mummy! It is known that Hatshepsut had no more sons; but her spouse, Tuthmosis II, had a son by Iset, a concubine not of royal blood; later this son became Pharaoh, now named Tuthmosis III. Despite the very vague royal descent of the latter outsider prince, this candidate being competitor to the throne was supported by some groups of powerful leading priests through a complex plot. This may have led to an internecine strife sealing the fate of Moses. Because Moses had to escape before he had taken over the Egyptian throne, he had not left the many conspicuous, "official" traces. Therefore, he had not, in contrast to many of the pharaohs, a life-long possibility of glorifying himself with buildings and monuments, or images and inscriptions about his life as the ruler of the country. When the Egyptian identity of Moses was officially cancelled, he was rendered "non-existent" in his native country of Egypt, all of which is another reason for the apparently lost traces of Moses in the very Egypt. Some traces which still may remain have frequently been ignored, especially because the Moses narrative mainly has been considered on the basis of much later times' interpretation of the biblical texts instead of from an Egyptian point of view. Ove von Spaeth has been able to present a better fixed historical time frame - also for the first time - by using a chronology based on astronomy. This is the most precise, specified method of dating known in these fields of research. This astronomical evidence is based on observations recorded in the Rabbinical Writings’ and proven by means of existing ephemeris. The writer demonstrates convincing evidence for a higher age than usually anticipated regarding the oldest parts of the 'Rabbinical Writings'. Many such data have only been possible to verify by modern techniques of our time. The author demonstrates that, consequently, the ancient data in question have to stem from sources close to the original ancient recordings. From now on, all this can better than ever before be related to archaeology and history. Here, the material itself indicates that the era of Moses was 200-300 years more back in time than often hitherto "accepted", - Moses seems to belong to the 18th Dynasty in Egypt rather than to the time of Ramses the II. A point that has caused severe protesting criticism from groups from the established research. Ritual mystery plays, the practice of which may almost seem inaccessible today, are now being placed into the right connection where they so obviously belong, i.e. as something vital and extremely important also in the everyday life of the past. And this book documents that in these cultic plays more valuable historical and anthropological data are contained than previously observed. The bibliography alone is worth a book. By international perspective, it constitutes the largest collection hitherto of scientific books and articles on Moses. Thus, the many concrete and specific data about Moses and his related time and place disclose a dramatic, moving, but hitherto unknown part of his fate - this being of greater coherence and logical wholeness which cannot be explained away. The result is: - a) an enhanced result for the dating of the existence of Moses in Egypt, and - b) a concretion of the background of Moses as a royal-born person and an Egyptian heir to the throne. This furnishes a genuine opening to the Egyptian past of Moses, which is indispensable when solving the enigma of the assassination of Moses. - More about the contents: Information points concerning this Volume 1 of the series "Assassinating Moses"
- Credentials, - about the author, statements from a number of scientific experts and professionals can be found e.g. on these pages: authordata-4: Reflecting views - and Zenith IC Project . The presented books and articles and were made possible by the support of readers like you ! This project for free scientific, historical research and information is supported by donations. A special treasure of knowledge and wisdom of Greece, Rome, and the Renaissance had originated in Ancient Egypt - and was here known to connect also with the historical Moses' dramatic fate and mystery. Ove von Spaeth has written an intriguing, new-orientating work presenting this still influential background of our civilization. • His interdisciplinary research on history, archaeology, and anthropology goes deeply into Egyptian tradition, history of religion, initiation cults, star-knowledge, and mythology - relating to biblical studies, the Rabbinical Writings, and the authors of Antiquity. • Each volume offers unique insights not presented before.